The Log Cabin is an authentic Canadian log cabin situated in Hayle, Cornwall. A unique and cosy couples retreat. 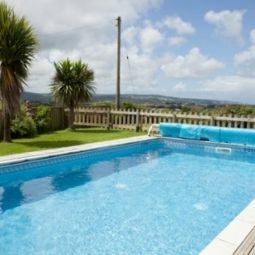 The Cabin is an authentic Canadian style log cabin situated in Hayle, Cornwall. Pine logs have been hand laid on top of one another to form this unique and romantic countryside retreat. Surrounding walks are plentiful and the famous Hayle beach is only a short drive away. Open the front door of The Cabin and be welcomed into the open plan lounge, kitchen and dining area. A cosy room which is filled with warmth from the fire. With reclining sofas, TV and DVD player, relaxation is assured. Tucked away behind the lounge is the shower room. A beautifully tiled room with a spacious power shower. The bedroom forms the back of The Cabin, here you can sit in bed and gaze out of the window at sweeping views of the countryside and wildlife- a world apart from 9 to 5. Kitchen with gas hob, electric double oven, microwave, fridge/ freezer compartment, dishwasher and I-Pod docking station. Dining table. Lounge with TV, DVD player, fire. Shower room with WC, wash basin, shower. Bedroom with double bed. Inclusive- Electricity. Gas. Heating. Duvets. Towels. Private parking for 2 cars. Garden Shop 1 mile. Pub 0.25m. Public telephone 0.25m. Beach 2miles. Tate Gallery St Ives 8miles. Truro City 19miles. Regret No smoking. Regret No dogs.